PAGASA weather report issued as of 5:00 a.m. this morning, wherein a Low Pressure Area (LPA) is seen 1,070 km East of Northern Luzon (16.7°N, 134.0°E), 'It is still too far to affect any part of the country'. 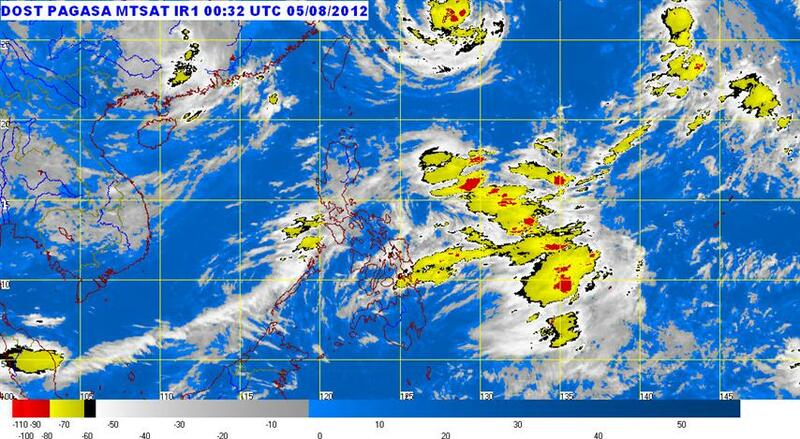 While southwest monsoon will continue to bring scattered rainshowers and thunderstorms over Luzon and Visayas. PAGASA tropical cyclone update said, "As of today, there is no tropical cyclone existing within the Philippine Area of Responsibility (PAR)." PAGASA also reported in their official site that there will be widespread rains over western section of Luzon and Visayas which may continue to trigger flashfloods and landslides. They have also warned people that this cloudy with widespread rains over the western section of Luzon may trigger flashfloods and landslides. Meanwhile, Metro Manila may still experience gusty rainfalls and cloudy sky because of Southwest Monsoon (Hanging Habagat), For an advise, if you ain't gonna do any impportant things this day, it is better for you to stay home and rest this Sunday. Comments or suggestions about "PAGASA Weather Report this August 5, 2012" is important to us, you may share it by using the comment box below.